Throw made of acrylic faux fur and rayon/silk velvet with polyester lining. Dry clean. 48" x 72". Handmade in the USA of imported and domestic materials. Cotton sateen. 102" x 90". Machine wash. Made in Portugal. About this collection: Bicolored cotton woven in an abstracted print like sateen jacquard duvet cover. Tailored in Portugal with knife seams and hidden button closure, it's a key component in our Artisanal Collection. EXCLUSIVELY AT NEIMAN MARCUS Optional monogramming available. 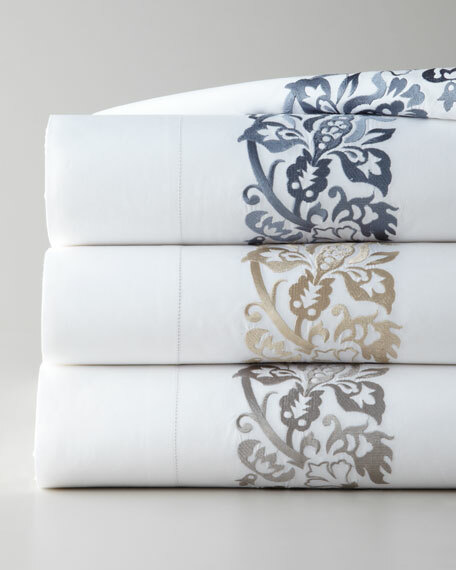 Pillowcases are woven of soft, 400-thread-count Pima cotton sateen and finished with an embroidered satin-stitch hem. Machine wash. Imported. Personalized/monogrammed orders cannot be canceled or returned. The monogram preview feature displays fabric color (not pattern), thread color, monogram style, and selected initials.